Amiodarone has several characteristics that make it unique among the antiarrhythmic drugs — and even among drugs in general. First, when taken by mouth, amiodarone takes weeks to achieve its maximum effectiveness, and for a very unusual reason. While most drugs circulate in the bloodstream for a while until they are metabolized or excreted, amiodarone is stored in the body’s tissues. The full antiarrhythmic effects of the drug are not achieved until the tissues are sufficiently saturated with amiodarone. So the drug has to be “loaded” before it becomes optimally effective. A typical "loading" regimen of amiodarone would be to use large oral doses for a week or two, then taper the dosage over the next month or so. It is not unusual to give people 1200 or 1600 mg per day at first and then, eventually, to maintain them on as little as 100 or 200 mg per day (orally). Amiodarone also can be administered intravenously when treating arrhythmia is urgent, and its effect is much more rapid by this route. However, switching from intravenous to oral dosing has to be done carefully, since for chronic usage the drug still has to be “loaded” for a prolonged period of time. Second, amiodarone leaves the body very, very slowly. It is not excreted to an appreciable extent by the liver or the kidneys. (Amiodarone is metabolized in the liver to desethylamiodarone, which has the same antiarrhythmic and toxic effects as amiodarone, and which also remains in the body for a very long time.) For the most part, amiodarone and its metabolites are removed from the body when amiodarone-containing cells are lost — such as skin cells, or cells from the gastrointestinal tract, which are shed by the millions each day. This, obviously, is a long, slow process. Thus, if it is determined that it is necessary to stop amiodarone (because of side effects, for instance) the drug remains in the body in measurable quantities for a very long time after the last dose is taken. The "half-life" of amiodarone, in contrast to most other drugs, is measured in weeks instead of hours. Third, because amiodarone is stored in many different tissues within the body, it can produce side effects affecting many different organs. Some of these side effects can take months or years to develop, so anyone taking this drug must always be vigilant for new side effects. Fourth, amiodarone works through many different mechanisms, unlike most drugs. It fits into two separate categories of antiarrhythmic drugs (Class I and Class III, for what it's worth). It acts as a beta blocker and also as a calcium blocker. It dilates blood vessels, and it often acts to "block" the effect of thyroid hormone. All of these effects contribute to its ability to treat arrhythmias and probably account for amiodarone’s unique effectiveness. 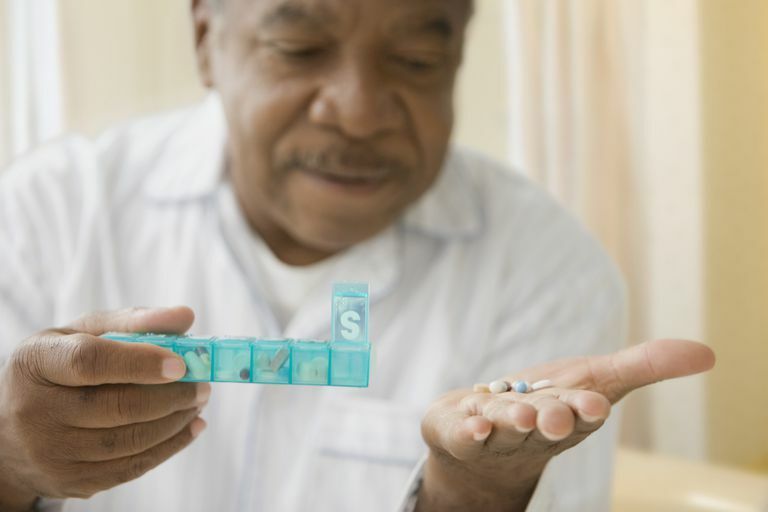 The side effects of amiodarone often take weeks or months (or even years) to develop, so anyone taking this drug must be vigilant as long as the drug is being used. Furthermore, the side effects of amiodarone tend to be very unusual for antiarrhythmic drugs — or for any drug for that matter. For these reasons, when amiodarone first came into clinical usage it took more than a decade for doctors to recognize that many of the strange symptoms they were seeing were being caused by amiodarone. To this day, doctors all too often fail to monitor their patients taking amiodarone long enough, and diligently enough, to recognize that the drug is producing problems. Amiodarone commonly causes deposits to form on the cornea of the eyes, often leading to "halo-vision," where looking at bright lights at night is like looking at the moon on a foggy evening. Amiodarone can cause a very disfiguring (and possibly permanent) blue-grey discoloration of the skin, generally in areas of sun exposure. Amiodarone often sensitizes the skin to sunlight, so that even trivial exposure can cause a fairly nasty sunburn. Amiodarone can cause thyroid disorders, both hypothyroidism (low thyroid) and hyperthyroidism (high thyroid.) These thyroid problems are quite common with amiodarone and can be unusually difficult to recognize and treat. For this reason, patients taking this drug should have their thyroid function routinely monitored. Amiodarone can cause liver toxicity, so liver enzymes need to be monitored periodically. Amiodarone can cause a rather severe form of acid reflux disorder. The most dreaded side effect of amiodarone is lung toxicity. This can take several forms. It can take the form of an acute lung syndrome that makes patients desperately ill, requires intensive care, and often results in death. Or, it can cause a more insidious, gradual, unnoticeable, "stiffening" of the lungs that both the doctor and patient can overlook until severe, probably irreversible lung damage is done. When Should Amiodarone Be Used? Because of the unique difficulties and risks of using amiodarone, this drug should be used only in people whose arrhythmias are life-threatening or very disruptive to life, and only when there are no other reasonable therapies. Despite its drawbacks, however, amiodarone truly is uniquely effective and has helped restore many thousands of people with disabling arrhythmias to a nearly normal life. When used appropriately, amiodarone can be a major benefit to people with severe cardiac arrhythmias. But because of its potential toxicity, its use should be limited. Any doctor who prescribes amiodarone owes his/her patient a careful discussion of the many potential problems that can occur with the drug and should commit to becoming a long-term partner of their patient, carefully monitoring for new side effects, for as long as this unique drug is being used. Goldschlager N, Epstein AE, Naccarelli GV, et al. A practical Guide for Clinicians Who Treat Patients With Amiodarone: 2007. Heart Rhythm 2007; 4:1250. Vassallo P, Trohman RG. Prescribing Amiodarone: an Evidence-based Review of Clinical Indications. JAMA 2007; 298:1312.